We all celebrated the UConn women’s basketball team on their 10th NCAA National Championship in April. A nail biting first half but a strong second half, as we have seen many times before. To me I prefer the women’s basketball over the men’s basketball games. The men always show individual strength as they drive to the basket and swing from the hoop throughout the game. The women constantly pass the ball around the court working as a team to find the best shot, not an individual effort, but a team effort. That’s what we want in our Granges... team players working together to get the best shot off for the WIN!! In the beginning, the women’s games were called the grandma league because grandmothers would take their grandchildren to the old fieldhouse stadium to watch the women play at $3 a head. When the women won their first NCAA championship, the ticket prices tripled and the corporate sponsorship was sought by the athletic department and the grandmas were moved to the upper level of Gampel Pavilion. After each winning season the ticket price has risen higher as well as the seating in Gampel. Now there are not many grandmas at the games, but they stay at home and root for their women every game, they even follow them on the road. This is team spirit and we should all learn from these grandmas.... GO HUSKIES! Inspections are well on their way, and I hope all is going well with the Deputies and others inspecting Pomona and Community Granges. By now the Blue Books are out so take a look at them for new projects and contests for our local Grangers to participate in. A reminder of the May 16th Social Connection event, “Hi! Ho! Come to the Fun Fair!” in Prospect. It sounds to be fun for all, so car pool and join in on the fun. I must also remind our members of the Connecticut State Grange Foundation. This is a foundation set up for tax exempt donations for the benefit of the Connecticut State Grange. It can also be used by Community Granges seeking tax exempt donations by setting up an account that the donations can be sent to the Foundation and then sent to that Community Grange within certain guidelines. Check with the State Grange Central Office for information on this Foundation. Since I have been your State Master I have received letters of well wishes and stories of members fond memories of their Grange experiences over the years. I enjoy hearing from you and thank you for your dedication and love of the Grange. 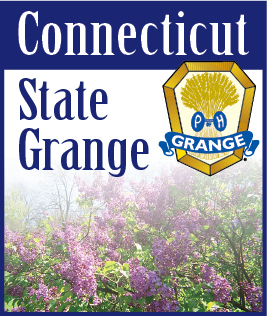 I ask that you not forget the Grange, donations can be given in your name to the Connecticut State Grange Foundation, as memorial gifts or even as a beneficiary from you or your family. I bring this up because many times family members don’t know about your Grange dedication. So please discuss with your family members if you wish to donate to the Grange. As we reflect this year we had the “COLDEST FEBRUARY” then the “SNOWIEST MARCH” then the “WETTEST APRIL” and now let’s HOPE that we have the most “MARVELOUS MAY.” Get out and enjoy the sun, we al need to recharge our batteries drained from this past winter. And I wish all mothers a HAPPY MOTHER’S DAY. May your kids spoil you with love and gifts because you deserve them for all you have done for us.